When teachers find a space where they can shine, something amazing happens: they find their voice. This voice resonates passion, curiosity, and love. It is a powerful voice with the potential to transform lives. The space that fosters this is found in a community where each teacher is honored and celebrated. This is the space the International Teacher Development Institute creates, and for the next 10 days, 22 voices will shine via the iTDi Summer Intensive for Teachers. To let your voice shine through, click here to sign up for any or all the free webinars your heart desires. I am very grateful to iTDi for this opportunity to learn and to grow. If you have the time, I’d love to see you at my inaugural webinar. We’ll be exploring something new I’m working with and I would love to hear your thoughts. You may have heard of S.M.A.R.T. action plans when it comes to creating lesson objectives or teaching goals. Although “smart” in theory, these action plans may leave teachers feeling dissatisfied to the point of inaction. One way to change this is to turn S.M.A.R.T. into a S.M.I.L.E. Based on research in neuropsychology and personal development, S.M.I.L.E. is an approach to action planning that can relieve the weight of overwhelm or perfectionism, and enhances our sense of satisfaction. During the session, we will examine this approach in order to develop the type of teaching practice we desire. I was excited to blog about research for the latest iTDi (International Teacher Development Institute) issue, Ongoing Research, because I knew it would kickstart my research into research. 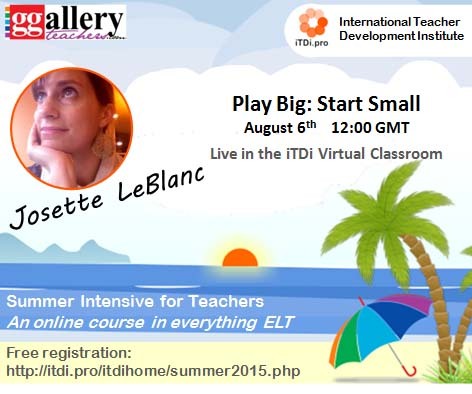 This is what iTDi does: it kickstarts your professional development. I’ve been involved with iTDi for almost two years now, and I have learned from various teachers from around the world, mostly from the comfort of my home. Each of them brings a fresh perspective to teaching, and the amount of inspiration they bring seems never-ending. For this latest issue, I had the privilege of writing alongside three of these inspiring teachers: Divya Madhavan, Kieran Dhunna Halliwell, and Nina Septina. Click here to read their insightful posts. I have a feeling you’ll learn something about research you probably hadn’t thought about, or maybe you’ll learn you aren’t alone in your worries about research. Either way, you’ll learn something new. Again, that’s what happens at iTDi: you learn and you grow. Below is part of my post where I explore my understanding of Narrative Inquiry as an approach to research. Follow this link to the iTDi blog to continue reading this post, and to find many posts about teaching and learning. I also encourage you to sign up as a member of iTDi. There are no strings attached; the only strings are connections to amazing teachers. I have a craving to learn. Part of this craving is satisfied by writing about teaching and learning here on the iTDi blog as well as on my blog, and also by talking with my inspiring community of teachers, but sometimes I think I need more. I think of working towards a PhD. The idea of diving deep into my topics of interest – how reflective practice and compassionate communication intersect in teacher education – seems like it would satiate my appetite. However, my research into research methods always left a bad taste. I just couldn’t imagine myself crunching numbers. My areas of interest seem to be beyond equations (re: quantitative methods), and too big for what I understand about action research. Then finally, this part of my search was over. Synchronicity Visits a Teacher – This is the post I wrote while I was doing my research for the issue. I learned that Throwing Back Tokens has a story that needs to be explored. You're so full of yourself!